Thyme for Cooking Dinner tonight: Chicken With Mushrooms and Broccoli. A stir-fry doesn't have to be Asian. This goes together quickly for a healthy dinner in under 30 minutes. 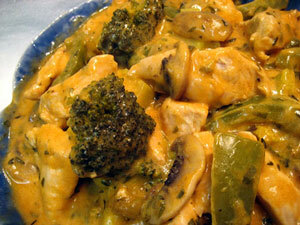 Tarragon and capers are the main flavor components of this chicken dish. They give a Mediterranean taste to the peppers and broccoli. It all cooks quickly, leaving the vegetables crisp-tender. Slice the green pepper into strips 1/4" (.6cm) wide. Cut broccoli into florets and peel and slice the stem. Trim and thickly slice mushrooms. Cut chicken into large bite-size pieces. Heat oil in nonstick skillet. Add onion and sauté 5 minutes. Add garlic, broccoli, mushrooms and pepper and sauté another 5 minutes. Add chicken and sauté until it's cooked on all sides. Add capers, herbs, wine, stock and tomato paste. Stir in cornstarch to thicken. Serve over rice or with buttered potatoes. 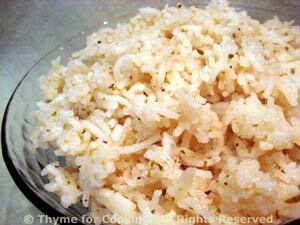 Simple, fragrant, fluffy, quick-cooking ....for me, the perfect white rice for a side dish. Melt butter in small saucepan over medium heat. Add rice and sauté, stirring for 2 - 3 minutes. Add stock or water and thyme. Cook rice for length of time on package. When done fluff with fork and serve. Note: Vary the herbs based on the main course. If fresh are available use 1 tbs, snipped or minced and add during the last 5 minutes of cooking time.